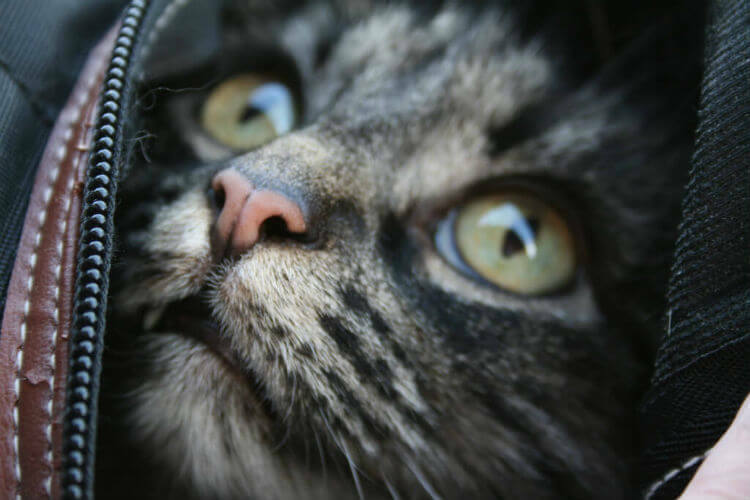 Owning a pet carrier for your cat is a priority for keeping your furry friend safe at all times. When you take kitty to the vet for a checkup, it only takes seconds for your beloved pet to escape, and you may not be able to find them in an unfamiliar area. Travel safety is especially important when on a road trip or flying on a plane. Finding a carrier that's the right size for your cat and provides a comfortable travel environment is key. 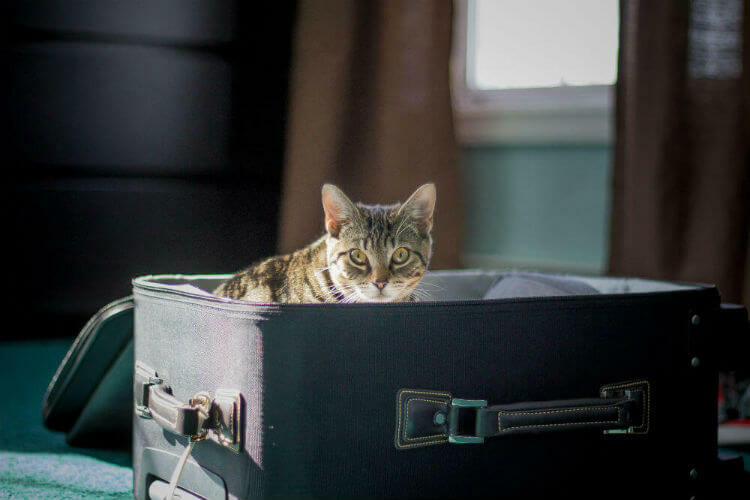 On any trip that you take with kitty, having their food, medicine, other pet gear, and a proper place to secure them will make the trip much more enjoyable for everyone involved. 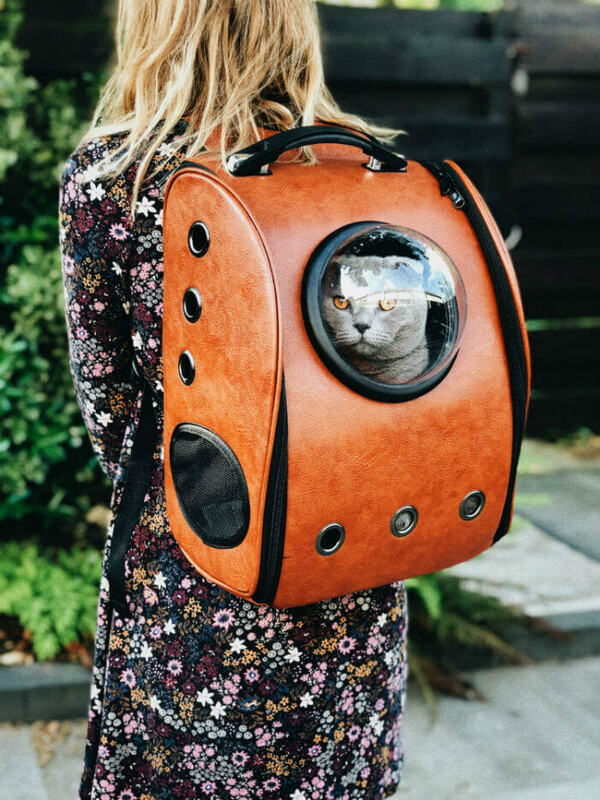 You'll want to find a travel bag that has ventilation for air flow and a window for checking on your kitty. It should also be large enough for the animal to be able to turn around and lie down, but not much bigger. Cats naturally like to have a snug space to curl up in, and you don't want yours to be sliding around in a carrier that's too roomy. If your kitty cat is a bit bigger, a large cat carrier might be a better option. If your feline friend is a bit on the smaller side (or is a kitten), you might want to look into a small cat carrier. There are plenty of decisions to make when picking out one of these pet essentials. You may want to have a lightweight one for everyday uses like going to the vet or a simple outing. An airline approved travel carrier should meet the requirements for taking kitty with you if you want to travel by air. In this case, a sturdy habitat will protect your pet from jostling and sudden stops. Below, you'll find some tips on choosing the right carrier based on what your travel plans may be. A collapsible, premium soft sided cat carrier should retain its shape when the openings are zipped closed. It should then easily fold flat for storage. Check the padding inside to ensure it's thick enough for your pet to be comfortable during a long trip. The best cat carriers have both a long strap and a short handle for different carrying needs. Other desirable features to look for in these products are mesh screens. A screen will not only allow an animal to see outside, but it will give you an opportunity to check on its inhabitant frequently. Soft sided carriers are lightweight and easy to carry. They often have long straps to carry the bag on your shoulder like a purse or bookbag. Most of these are made from easily cleaned waterproof nylon fabric. Even better, there are many premium soft sided bags that come in plenty of fun colors! 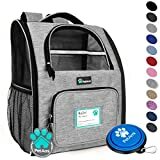 You might want to shop around for a travel cat carrier that has padding at the shoulder to protect against muscle strain when carrying your pet. A backpack carrier is another great option for pet parents on the go. They're convenient if you plan to do a lot of walking with your feline companion. Cat carrier bags will have shoulder straps while others look more like traditional backpacks. 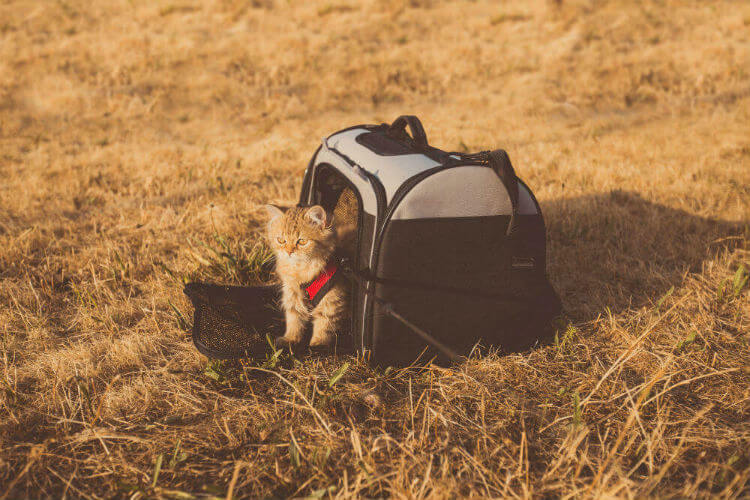 Almost every backpack carrier will have a bubble or mesh opening so that your cat can see her surroundings when you're out and about. Not only will kitty love exploring with you, but your hands will be free as well! A pet stroller is another great option for a walk with a pet. Dog and cat strollers are often designed to fit many smaller animals. These products will usually have some sort of mesh net over the seat in order to keep kitty (or Fido) safely contained while you both enjoy the outdoors. A hard sided carrier provides more protection during travel. This type of transport is generally heavier and takes up more room in storage. You'll want to have the same basic features as in a soft one like plenty of ventilation and a mesh window. Hard containers with padded bottoms can add comfort while also providing a solid surface to stand on. If the carrier doesn't already have a padded bottom, add a blanket or other soft object to make it comfier. With air travel, it's especially important to find out the airline's size restrictions for pet gear. You can't "scrunch" most hard sided containers to fit it in the allotted space, after all. Hybrid versions are available as well. Too big for air travel but great for road trips, a collapsible hard sided carrier has the best features of both soft and hard products. There are plenty of brands that have tops and bottoms made of sturdy, waterproof plastic that can collapse when not in use. 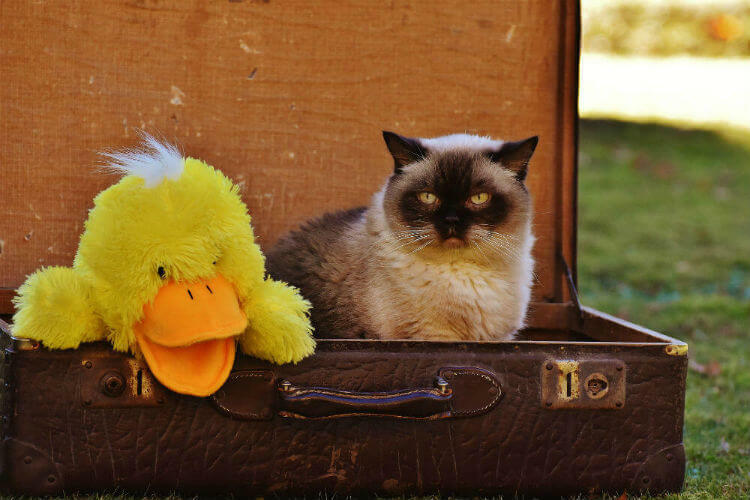 Why Travel with Your Cat? Kenneling for cats is different than for dogs. Canines can be free to run around in a fenced area for exercise, but felines have to be kept indoors. This is because they're much more adept at jumping over obstacles and climbing fences. It's not good for any animal to be confined to a small space for a long period of time. Keeping your furry friend kenneled may be okay for a day or two. It's better to take kitty with you if you're going to be gone for more than a couple of days, though. Courtesy photo from Joint Base Elmendorf-Richardson. For a road trip, it's a good idea to have kitty transport that you can strap in with a seat belt. This helps keep the traveling kennel from sliding around; extra movement can cause carsickness or even injury. A hard carrier or a sturdy soft sided one can work for car trips. 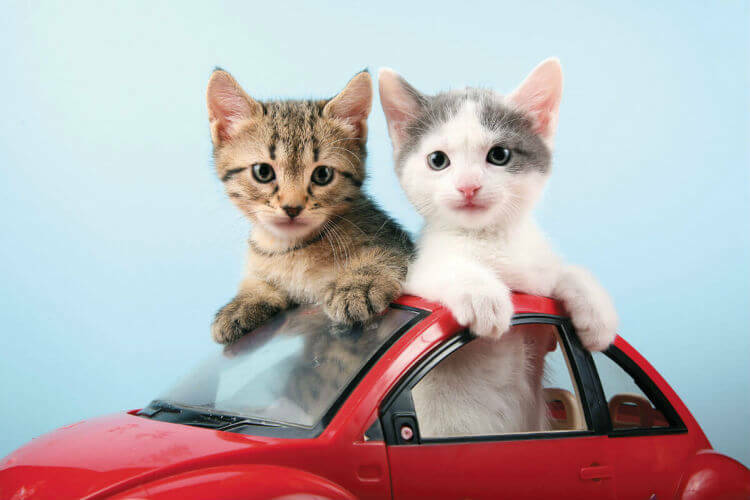 Keep your pet contained at all times when the vehicle is moving. It might be a good idea to shop around for a deluxe pet carrier with added features if you’re going on a particularly long drive. A luxury soft sided carrier, for example, can help make the trip a bit cozier for your feline companion. Traveling is not the time to change your cat's food or eating habits. So be sure to bring enough of your pet's regular food to last for the entire trip. Stick to the same feeding schedule as at home as much as possible. As for water, bottled water is an easy way to help hydrate your furry friend during the day. It's best to feed and water kitty during a rest stop to decrease the chances of a spill. Remember to bring any treatments that are part of your animal's regular routine at home. If you use pill-pocket treats or a medicine dropper, bring those along as well. Be sure that kitty is wearing a collar with identifying information. Microchipping is another good option from keeping track of your beloved furry friend. Other pet gear to consider are litter boxes and accessories. You can use a cardboard box as a disposable litter box. A small, travel-sized box can also work. Bring some of your pet's favorite toys to help them feel at home when you stop for the night. A cat harness and leash are also vital gear to take with you. There may be times that you have to free your cat of its carrier. These points are when you run the greatest risk of losing your pet. This makes wearing a fitting harness and leash all the more important. Take kitty outside for short periods wearing the harness with the leash attached in the days leading up to your trip. It will be less stressful if your pet is already familiar with the harness. Keep the harness on kitty at all times during travel. Remove the leash when they're in their travel bag, however. The first thing to do when flying with your cat is to find out the requirements for pet carriers. Call the airline directly to make sure, and try to get a written confirmation of their policy. The airline may be able to e-mail you a copy, or you can find a page to print from their website. Delta Airlines, for example, currently sets the maximum allowable dimensions for a soft or hard sided kennel at 21 x 15 x 16 inches (53 x 38 x 40 cm). Some other airlines have tighter space requirements, so check with your airline before traveling. You'll to meet the space criteria for fitting beneath the seat in front of you on the plane. Keep your cat's vaccination information and health certificate with you at all times. Arrive early at the airport since there are limits as to how many pets can travel on each flight. If the plane is overbooked for pets, you don't want to be the person who gets cut from the passenger list. If that happens, you will either have to put your pet in the cargo hold or wait for another flight. The Human Society of the United States offers a list of recommendations for traveling with your pet, including what to do if you have to place your furry companion in cargo. Choose a seat with the most free room underneath the seat in front of you. Aisle seats are convenient yet they often have less storage space for your kennel. Make sure the seat you select isn't in an emergency row or at the very front of the plane. Flying can be dehydrating for humans and pets alike. You don't want a water bowl to spill, though. A great solution is to include a clean, water-saturated sponge in a shallow bowl for kitty to lick. Having the right carrier for your cat will make any trip easier on both of you. Finding a portable kennel that's the right size yet still comfortable is the first step. Soft sided carriers are lightweight and comfortable for easy travel while hard sided ones are great when you need something sturdier. Hybrids of the two are also available. There's a large selection that are airline approved as well. So whether it’s a deluxe pet carrier with a hard exterior or a luxury soft sided one, you should have no trouble finding the right cat carrier for your pet. Disclaimer: This article is neither reviewed nor endorsed by Delta Airlines or the Humane Society of the United States. This article should not replace the advice of a veterinarian. Comments, questions, or concerns about specific products should be directed to a vet or the product manufacturer.